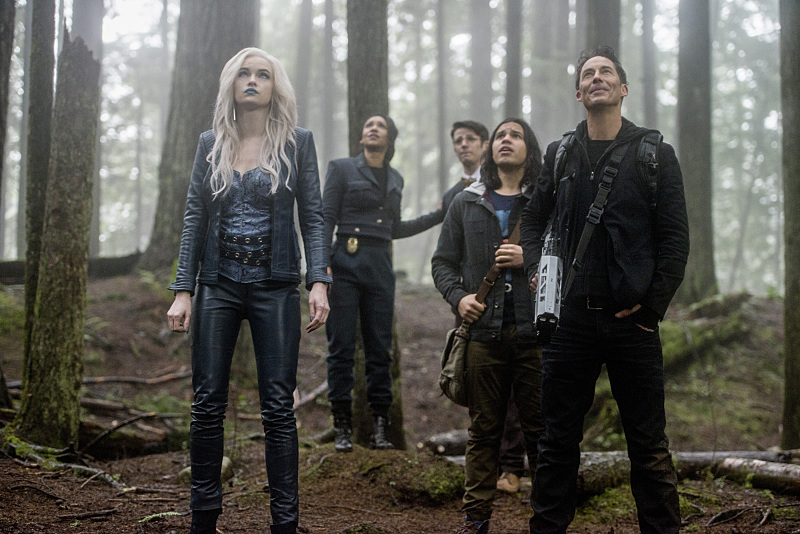 The Flash -- "Escape From Earth-2" -- Image FLA214b_0224b -- Pictured (L-R): Danielle Panabaker as Killer Frost, Candice Patton as Earth 2 Iris West, Grant Gustin as Earth 2 Barry Allen, Carlos Valdes as Cisco Ramon, and Tom Cavanagh as Harrison Wells -- Photo: Bettina Strauss/The CW -- ÃÂ© 2016 The CW Network, LLC. All rights reserved. We get part 2 of The Flash’s journey to Earth-2 and while not as great as part 1, still packed an emotional punch but at the same time brings up some questions about Jay Garrick. We see Zoom running around Central City, branding buildings and passing out flyers placing a bounty on Harry’s head. Cisco has arrived back at STAR Labs to tell Harry what went down like how Zoom killed Deathstorm and his Earth-2 counterpart while sparing Killer Frost and taking Barry to his lair. Harry and Cisco aren’t sure what to do next but then hear Earth-2 Barry, whom I will call Allen, shouting for help. The two break him free and decide he can help out. Allen is quite funny as he is a bundle of nerves of every little thing. Unfortunately, Zoom arrives and the three hide in Harry’s time vault and uses a fake wall to trick Zoom in leaving. The three know they have to leave STAR Labs ASAP. When Allen returns to the CCPD, Iris reams into him for not coming after shortly after her dad died. Allen tells Iris that he heard about Joe’s death and she gets confused as to how he heard when he was there with her. Iris finally learns that the Barry that was with her was from another Earth and things fall into place. A plan is placed in using Killer Frost to help locate Zoom’s lair as Cisco believes she will help since Zoom killed Ronnie. Allen uses files the CCPD has on Killer Frost (compiled by CSI Patty Spivot) and determine to most likely place to find her is in a woods in Central City. The Flash — “Escape From Earth-2” — Image FLA214a_0277b — Pictured (L-R): Zoom and Grant Gustin as The Flash — Photo: Diyah Pera/The CW — ÃÂ© 2016 The CW Network, LLC. All rights reserved. Meanwhile, Barry is trapped in Zoom’s lair. Barry wonders about the man in the iron mask and Jesse says he’s has been there since she arrived. We see the man try and communicate with Barry and Jesse. Jesse thinks it is nothing but is convinced to help once she hears her father say she was smarter than him. The two figure out he is spelling out a name: Jay. Barry figures he means Jay Garrick and it is confirmed but the man gets frustrated when Barry says that Jay is on Earth-1. Before the man can tap anything else, Zoom arrives and tells Jesse that she is only alive so he can kill her in front of her father and Harry is still living so he can help get Barry’s speed. Zoom then phases into Barry’s cell and starts to beat him up. When Zoom is finished, he leaves but this gives Barry the idea to phase out of the cell to escape. Unfortunately, Barry tries many times and cannot. Methinks this man is the actual Jay Garrick which makes me wonder who is over there on Earth-1. The Flash — “Escape From Earth-2” — Image FLA214b_BTS_0022b — Pictured: Behind the scenes with Grant Gustin as Earth 2 Barry Allen — Photo: Bettina Strauss/The CW — ÃÂ© 2016 The CW Network, LLC. All rights reserved. In the woods, Cisco, Harry, Iris and Allen (who tagged along to ensure his wife is safe as Joe would have wanted it). They all find Killer Frost who isn’t willing to help and gets lippy with the team that prompts Cisco to call her Elsa of Frozen fame. Killer Frost starts throwing her icicles at the team and everyone gets out of the way but she is eventually corned by Iris, Harry and Cisco. The Flash — “Escape From Earth-2” — Image FLA214b_0224b — Pictured (L-R): Danielle Panabaker as Killer Frost, Candice Patton as Earth 2 Iris West, Grant Gustin as Earth 2 Barry Allen, Carlos Valdes as Cisco Ramon, and Tom Cavanagh as Harrison Wells — Photo: Bettina Strauss/The CW — ÃÂ© 2016 The CW Network, LLC. All rights reserved. Cisco is the one to get Killer Frost to help by appealing to her love for Ronnie. Killer Frost takes them to where Zoom’s lair is and it along a cliff face. Allen is quite funny as he makes excuses not to use Killer Frost’s ice holds to climb the cliff. When Earth-2 Team Flash arrives in the lair, father-daughter are reunited with Killer Frost breaking Jesse’s chains. Killer Frost is unable to freeze the glass of Barry’s cell. So Barry urges the team to go back to Earth-1 as the breach is going to close soon. The team doesn’t want to go and it takes Allen to give a pep to talk to Barry that convinces him that he can phase through and he does. The team has to leave as Zoom is on his way but Barry doesn’t want to leave the man in the iron mask behind. However, Zoom does come and thanks Killer Frost for bringing everyone to him. Cisco tells Killer Frost that her Earth-1 counterpart would be disappointed in her. When Zoom makes to kill Jesse in front of Harry that prompts Killer Frost to stop it by holding him in ice. The team escapes and Barry promises to come back for the man in the iron mask. News reports are all on Geomaner and the devastation he has caused. At Central City Picture News, Iris meets her new editor, Scott Evans (Tone Bell), who kills her story on the Geomancer as it was pro Flash. Evans is anti-Flash and doesn’t want stories having people belive the Flash can save them. Iris offers to do a story on the other Flash, Evans is reluctant but agrees as he is most likely going to kill it. Caitlin is still working on Velocity 8 and tells Jay that Velocity 7 has made his condition worse. Iris drops by STAR Labs and asks Jay to do a story on him. Jay is uncertain but nothing more can be said when a live news report has the Geomancer calling out the new Flash. The Geomance uses his earthquake powers to cause a hospital to collapse. Luckily, Caitlin has bypassed Velocity 8 and went straight to 9. Jay takes it and rushes off to save everyone in the collapsing hospital. Jay returns to STAR Labs and is still on high for saving everyone and being the hero once more. Jay is more open to doing the story with Iris but she tells him that she has got what she needs. Jay tells Caitlin that he is going down below to take nap to rest from the day’s events. Later, Caitlin notices something positive as a result of Jay taking Velocity 9 and calls him to come up. Unfortunately, Geomancer shows up and starts creating earthquakes throughout STAR Labs and he chases Caitlin and Iris to another part of the lab. One of Geomancer tremors knocks down some shelving that takes out Caitlin. Geomancer is about to attack Iris but Caitlin shoots a shock collar on him thus capturing him. Joe decides to take Geomancer to Iron Heights. Jay is apologetic for not being able to get there in time to help. No matter says Caitlin as she tells Jay that Velocity 9 is actually healing his damaged cells. Jay thanks Caitlin for everything and they share a kiss. An alarm alerts them to a problem with the breach portal. Unfortunately, all of the tremors that Geomancer caused the breach to become unstable again (after Jay fixed earlier in the episode). Jay has a way to fix the portal so that Barry et al can come back as time is running out. With Joe’s help, Jay uses his speed to create a vortex to get the portal working again while Joe turns on power rings. Jay’s Velocity 9 runs out but the portal is working again. Meanwhile, over on Earth-2, Barry tells the West-Allen’s to get out of town so off they go to Atlantis. Harry tells Jesse they can’t stay on Earth-2 anymore as Zoom won’t stop chasing them. The first two to emerge from the portal are Cisco and Jesse. Just before Barry goes through, Zoom has Harry but he inject Zoom with probably that serum that was developed earlier this season. Barry and Harry make it back to Earth-1. Jay closes the breach. Hugs are had and things look great but just before the portal closes, Zoom stabs Jay in the chest and pulls him back to Earth-2 and Caitlin is crestfallen. Next week is King Shark so we may not see the what exactly happened to Jay.